In an effort to further annoy busycorner, Paul and I spent a lovely island morning inside my house with the curtains drawn watching “My Cousin Vinny” today. Paul wasn’t feeling too hot, and I’m on school break and feeling little motivation to get off the couch. I’ve seen the movie many times, but I didn’t remember one particular line when the judge tells a leather-jacket-clad Joe Pesci to “wear a suit—made of cloth.” It made me laugh out loud. It’s funny how re-watching something can bring new things to light, and make missed details come to the surface. Another example is how watching “The Wire” the second time around is amazing because you can worry less about story and revel in the details. It brings a whole new level of depth to the show. This idea of the second experience being richer than the first has been my experience with group 82. The deer-in-the-headlights blank-mindedness of the training experience can be rough the first time around, and watching someone else go through the process fills in a lot of the stuff I missed the first time around. 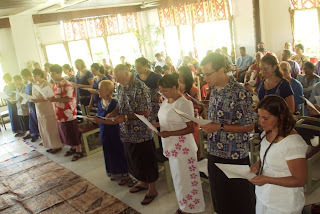 The first time I felt this was at their ’ava ceremony on the day they arrived when the orator was cracking jokes and mocking PCV Benj’s “chee-hoo”. 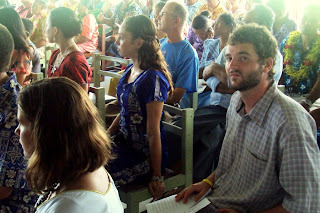 The newly arrived trainees were on edge and too nervous to enjoy the humor, but for those of us participating in the event for the second or third or fourth time, it was a grand old time. There was an element of that feeling at Group 82’s Swearing In ceremony this afternoon. 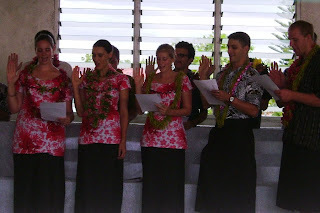 Swearing In is when you transition from being a Peace Corps Trainee to a full-fledged Peace Corps Volunteer. It’s an awkward moment because you’re mentally exhausted after 2 months of training, you’re elated to be finished, and you’re apprehensive about moving to your permanent site. It’s a stressful time, to say the least, and the hour-long ceremony of speeches and formalities seems like more of an affirmation to the attendees rather than the actual trainees who swear in. My memory of our Swearing In is a bit of a blur, but it came back as I sat through group 82’s this afternoon. There was a prayer and the training director’s speech and the country director’s speech and the Charges d’Affairs’ speech. Much like a first communion or a graduation, there are a lot of formalities and “things to be said” beforehand, and then the actual central event is extremely short. The kid gets the wafer, the graduate crosses the stage, the trainees stick their hands in the air and read the oath (they didn’t actually stick their hands in the air to swear in, to the disappointment of the many photographers in the room). PCT Martin (now PCV Martin) gave a short speech thanking the host village and the training staff, and emphasizing the bonds forged in group 82, and how the real work starts now. I think it echoes the speech that Chris gave on behalf of group 81, but I couldn’t tell you for sure. It’s kind of a blur. I hope you're well. Pictures below. Group 82s. Front row left to right: Emily, Martin, Allison, Elisa, Dan. Bill and Kathleen in the foreground. Back row left to right: Jenny U., Rachel, Tiffany, Cassandra. 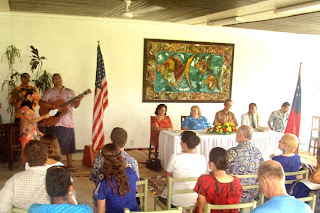 PCT/V Corina sings a song with one of the language trainers, as the dignitaries look on. At the table left to right: MESC representative, Charge d'Affairs Robin, Country Director Dale, Manunu Faifeau, Assistant Country Director Fata. Group 82s. Lili in foreground. 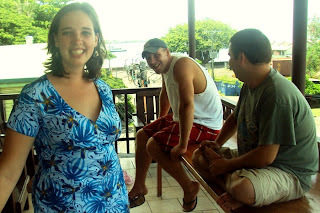 Jenny in red in the back, Dana in blue, Matt looking into the camera. Blakey, Dan, and Koa chilling outside. Group 81's Swearing In where we did indeed raise our hands. We also had to walk to the village. Uphill both ways. Kids these days. Get off my lawn. "kids these days. Get off my lawn." SOOOO funny!! 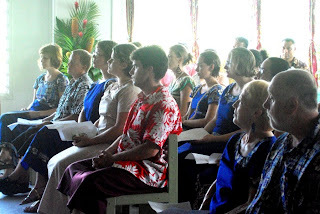 pay no attention to people trying to tell you how to spend your time there in Samoa...you live how you want to live. You're doing great!!! !